Can Olive Oil Cure Cancer? I heard that olive oil can kill cancer cells. Does that mean that it can actually be used to treat and cure cancer? In light of this news, should we include more olive oil in our diets to prevent cancer? Scientists have known for some time that olive oil can kill cancer cells, but research published online in January of 2014 may help explain its anti-cancer effects. Investigators from Rutgers University in New Jersey and Hunter College in New York reported that oleocanthal, a compound in extra-virgin olive oil, ruptures membranes of lysosomes, the structures within cells where wastes are stored, leading to the release of enzymes that cause cell death. This happens in cancer cells without harming healthy cells. In an interview with Olive Oil Times, coauthor Paul Breslin explained that oleocanthal develops in olives when they’re crushed to make the pulp from which oil is pressed. He also noted that oleocanthal has been shown to reduce inflammation and inhibit cancer formation and growth. In the study, oleocanthal caused cancer cells to break down and die within 30 minutes, instead of the 16 to 24 hours necessary for programmed cell death, known as apoptosis. The researchers used laboratory cultures of breast, pancreatic and prostate tumor cells from mice to see if they could be killed by oleocanthal, or to be more specific, by the process of “lysosomal membrane permeabilization” (LMP). The new findings suggest that the lysosomal membranes of cancer cells are weaker than those of normal cells. Because of its effect on them, oleocanthal may turn out to be an effective treatment for cancer. But we’re not there yet. The research team is now turning its attention to whether or not LMP is the primary reason why tumors in mice shrink with exposure to oleocanthal. They also plan to investigate the compound for killing cancer cells and shrinking tumors in living animals and to explore the reasons why cancer cells are more sensitive to oleocanthal than non-cancerous cells. We know that olive oil has the highest percentage of heart-healthy monounsaturated fat of any edible oil. Quality olive oil also contains abundant antioxidants that have been shown to provide cardiovascular and anti-cancer effects. Research from the University of Athens published in 2003 showed that people who eat a Mediterranean-style diet have a 33 percent reduction in the risk of death from heart disease, and a cancer death rate that is 24 percent lower than that in people who eat typical Western diets. 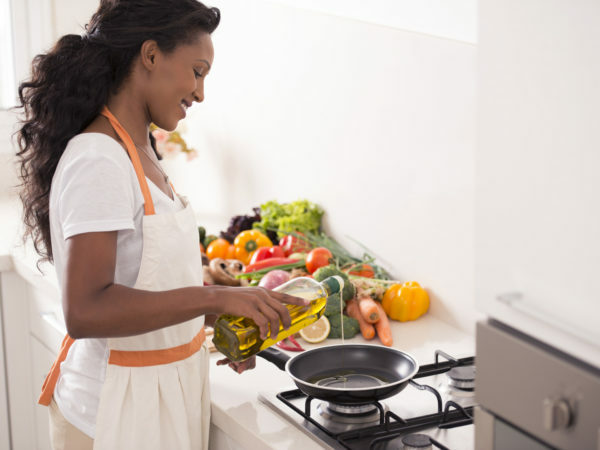 The Mediterranean diet was the template for my anti-inflammatory diet, and I have long recommend using extra-virgin olive oil as your main cooking oil. Paul Breslin, David Foster, and Onica LeGendre, “Oleocanthal Rapidly and Selectively Induces Cancer Cell Death Via Lysosomal Membrane Permeabilization (LMP),” Molecular & Cellular Oncology.